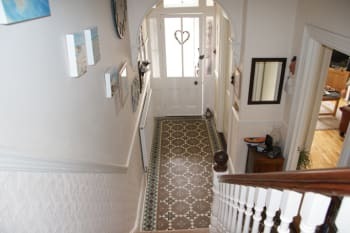 Blue Sky B&B St Ives is a granite built Edwardian house in St Ives, within 5 minutes walking distance of the beaches and town centre. Conveniently located for the South West coastal path and the many attractions West Cornwall has to offer. Lindsey and Simon welcome you to their home where you can be guaranteed a warm welcome, comfortable beds and a delicious breakfast. There are three double rooms available on the first floor, all with en-suite shower rooms. They have flat screen TV, tea and coffee making facilities, hair dryers and broadband wi-fi access. There are no rooms available at Blue Sky for these dates. A large double room with superking sized bed or twin beds, with a sofa bed available for younger guests, en-suite shower room. This room has views across St Ives bay. Es ist fantastisch...Lindsay und Simon sind grossartige und liebenswerte Gastgeber. Wir würden es immer wieder buchen. Had a lovely stay nice, clean, comfortable room. Lovely breakfast and great location. Very friendly and familier location. We loved the choice at breakfast, hot and cold. It was also nice having decaf tea and coffee with fresh milk on hand so we could make a cup after a long day of exploring. Your lemon drizzle cake was amazing! Lovely new bathroom. Thank you for all your local knowledge. We thoroughly enjoyed our stay here and Simon and Lindsey made us very welcome. Our room was spacious and comfortable and we had everything we needed. Breakfasts were delicious, with a varied choice each day. Being able to park at the B&B was a real benefit and its proximity to the town made it easy to go out in St Ives. Lots of good eating places in St Ives. We particularly enjoyed The Seafood Cafe and, for a special meal out, we can recommend Black Rock. Regarding places to visit, St Michael's Mount and The Menack Theatre are both really interesting. Lovely room, great breakfasts, have a special. Owners very helpful and friendly which makes a very welcoming homely atmosphere. Very friendly but not imposing. Gorgeous property and well presented cosy rooms. Gorgeous fruit at breakfast and fabulous new special every breakfast, try the blueberry pancakes with bacon and maple syrup! We will be back! We had an amazing stay with Blue Sky and could not of been made more welcome by Simon and Lyndsey. The breakfast was amazing, our room was spotless and our hosts were so attentive. Thank You we will be back ! We stayed in the room at the front. A lovely big room with great views. The bed was amazing, with top quality bedding. The shower room had a great powershower, and the towels were of top quality too. The breakfast was very good with a wide choice from fresh fruit and berries to cereals, toast and full english. There was also a special on offer everyday. Simon was a great host, very pleasent and obliging. will definitely be returning. Absolutely amazing. I would stay here again in a heartbeat. Beautiful room and Simon and Lindsey were fantastic hosts. Everything about my stay was perfect and Blue Sky is a really welcoming place. The hosts were fantastic and made sure that I had everything I needed including good tips on walks and local transport. Breakfasts were superb!! we got a very warm welcome from Lindsay and Simon.Excellent room (Trencroom) and superb breakfast. free parking lot, necessary in St. Ives. Only a short walk to city center and harbour. A friendly welcoming atmosphere. Excellent breakfast with plenty of choice. Parking is available and the Bed and Breakfast establishment is close to the centre of St Ives. I will certainly come again. We were interested in the early stone circles and sites of which there are plenty. The skyline is dotted with iconic tin mines and a visit to the Levant tin mine is a must. The coastline is dotted with attractive fishing villages which are well worth a visit. We have just got back from a fabulous four day break staying in Blue Sky - what a great place to stay, being looked after so well by Simon and Lindsey. Very friendly, comfortable, helpful and delicious breakfasts, especially the daily special. Something different every day and always tasty. When we arrived, we were shown to our room - Godolphin (spacious and clean with a balcony and view of the sea) and then welcomed downstairs with coffee and a chat about local eateries and tips on getting around. Also helpful tips on places we had in mind to visit during our stay. We appreciated all the little extra touches which show care and show a genuine interest in wanting guests to really enjoy their stay. For example, we visited the Minack Theatre for a performance (highly recommended) and Simon kindly leant us cushion seats so we were comfy during the play. Blue Sky has it`s own parking spaces, which I believe can be difficult in St Ives, and is literally a five minute walk to Porthminster beach and into the town. So once you`ve parked up - you can get around easily without moving the car again. The railway station is a five minute walk too. We can well understand why people make many return visits to Blue Sky - we will certainly be returning ourselves and know that we will be greeted with a warm welcome and enjoy a comfortable and relaxing stay. Simon and Lynsey were extremely friendly and helpful. The accommodation is lovely and spotlessly clean. The breakfast is probably the best I've had! I would recommend the Blue Sky and will certainly return. 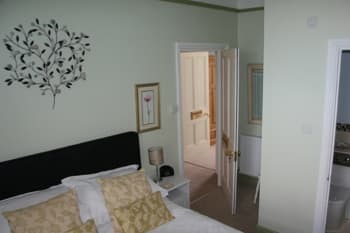 Traditional B&B, clean and lovely room, kind and friendly landlord and landlady. Nothing to complain. A variety of different types of restaurants to suit all tastes. A visit to Lands End is must but parking is quite expensive an option is to park at Sennen Cove past the lifeboat station which is half the price and walk along the coast path to lands end the views are stunning. We had a very enjoyable stay in St Ives at Blue sky, the location was fantastic and Simon and Lyndsey were extremely welcoming! The breakfast was delicious as well, set us up for a day of exploring.Thank you very much! We had no difficulty with food ... amazing Cornish pasties. Enjoyed a lovely meal at Pels. Simon and Lindsay greeted us with a warm, friendly welcome. Food was amazing not just a full english breakfast but offered a special each morning aswell. Advised us on eateries and best ways to get to places. Would recommend this b & b and would definitely stay here again. Really lovely place to stay, the owner was really helpful and the room we had was great. Lovely view of the see with well placed chairs to enjoy the view. Close to the town centre and serves probably the best full English breakfast I've ever had. Highly recommended. Thank you for your helpful tips regarding activities and places to eat. We enjoyed the breakfasts with daily varying specials. Don't miss Minark theatre and the walk from Senner's Cove to Land's End. Very comfortable large room with a nice view. Very friendly owners. Really liked the fresh fruit for breakfast. Thank you for being so helpful for ideas about walks, driving and local restaurants. Lovely bright well appointed room with view of the sea from the bay, and super king size comfy bed, great shower. Handy parking and a different breakfast special every day! Lovely welcome with lots of advice about walks and the local area. Gorgeous breakfasts. Gorgeous sandy beaches.Excellent walking as near to the Coastal Path. The Lifeboat Inn was good for food and beers & excellent service. Also enjoyed the Seafood Cafe. What a wonderful place to stay! The room we had wasn't huge but it was private, clean, comfortable and had everything we could need. This was our first experience of St Ives (and a B&B) and the Blue Sky was perfect. Located a stones throw from the Harbour side we were close enough to be able to walk to the many bars and restaurants but far away enough to not be affected by any noise. Simon and Lyndsey were wonderful hosts, ready to answer any questions we had or advise us of the best places to go to. Also with breakfast included in the price (and consisting of not just your standard full English but 'daily specials' such as blueberry pancakes, eggs benedict, etc.) it made the B&B really good value for money. Our experience at the Blue Sky was better than many hotels we've stayed in and we would definitely recommend it to others. St Ives is beautiful and filled with wonderful places to eat and relax. We particularly enjoyed The Lifeboat Inn (I would highly recommend the Ploughman's Sharing Board), The Rum and Crab, and The Hub Box which are all located on the Harbour Side. There is also The Sloop Inn for a pint of Cornish Rattler (lethal stuff!) or the Upper Deck if you prefer a quiet glass of wine. We ventured down to Lands End on our one day where we had nothing planned, which was lovely to see and wasn't too far away by car. Simon and Lindsay run a really nice B&B and are very friendly and welcoming without being overbearing. Would have no hesitation going back for another stay or recommending. Lovely warm welcome from Simon & Lindsay. Excellent tour of Barbara Hepworth museum & garden at 1pm daily. Friendly, welcoming.Perfect hosts in the perfect B&B. Great breakfast options too. Couldn't fault anything. The b&b is lovely, very homely. Breakfast was fantastic, choice of a full English or a special for the day, both of which were great. Simon was very friendly and attentive. Would recommend to anyone looking for a base to explore the town, far enough away that it's very peaceful yet close enough to be in the thick of it all within a few minutes. The ghost walk from the quay was very good! Thank you so much for such a lovely stay. The room was clean, fresh, comfortable and well equipped. The breakfast was excellent and Lindsey and Simon were welcoming and helpful. We will certainly return. Fantastic welcome, fantastic hosts fantastic time. Perfect location Easy walk into centre, free parking. Great facilities. Loved the breakfast! Amazing pancakes :) The yoghurt/fruit/nut selection was great too, thanks. We had dinner at the Porthminster Kitchen on Saturday night and really enjoyed it. 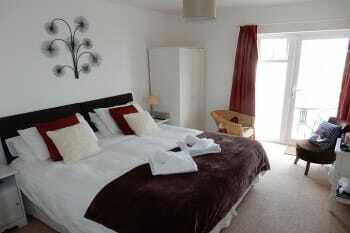 Very comfortable large bed, good view over St.Ives bay. Excellent breakfasts. Warm welcome, very helpful about finding our way around and where to go. Thankyou. Satnav will get you there but the street signs are'nt all that clear. Porthmerrion Terrace is staight ahead uphill as you turn the bend on the one-way system, not to the right. We were made to feel very welcome by you when we arrived. Nothing was too much trouble. A very relaxed and friendly environment. Breakfast was great, a wide range of food from cooked to fruit and cereals. Although it is a short walk to the harbour it is on a steep hill, should be considered if there are mobility issues. If you like pub food, then we recommend the Sloop pub on the harbour. Fantastic accommodation with very friendly and helpful, welcoming hosts. Fabulous choice for breakfast with daily specials as well as a cooked breakfast and fresh fruit and cereals.Very comfortable rooms with excellent en suite. Could not ask for a better place to stay. Made our New Year even more special. We have just returned from a weekend break in St Ives where we stayed at Blue Sky B&B for 2 nights. We had a wonderful weekend and we would not hesitate to recommend Blue Sky B&B to others for the following reasons: Simon & Lindsey are the perfect hosts, very welcoming, friendly and they were attentive to our needs at all times. The accommodation is of a very high standard indeed: well equipped, spacious, charming interior, warm, comfortable & cosy. Superb location providing a great view across the bay from our room. It was only a very short walk from the heart of St Ives, meaning we did not have to use the car once. It is situated in a very quiet and peaceful residential area with no through traffic. Having an on site car parking space was very handy, no doubt these are quite rare in St. Ives! First class breakfast - all the options you could wish for: fresh fruit / nuts / seeds, cereals, yoghurts, toast, a daily special and of course my own personal favourite full english cooked breakfast, all using top quality ingredients. We had all of the above for a discounted room rate which provided superb value for money. We would like to take this opportunity to thank you again Simon & Lindsey for welcoming us to your wonderful B&B. We hope to return again someday! Would recommend Harbour View Fish & Chips near the life boat station / jetty which turned traditional fish and chips into a wonderful gourmet experience. Also, you just cannot beat The Sloop - a traditional pub (a dying breed these days!) with tonnes of atmosphere and live music on both Friday & Saturday night, we had the ultimate surf and turf which was simply amazing! Excellent location for access to town centre and train station is only a 5 minute walk for easy access to other locations. Very accommodating, friendly and helpful proprietors with good local knowledge. Breakfast was of a high standard with plenty of choice. St Ives is a very picturesque harbour-front town with many individual shops. Good choice of restaurants, cafes and art galleries including the Modern Tate Gallery. Everything was great - lovely and well maintained room & bathroom, lots of thoughtful touches in the decor, liked the binoculars to look out to sea with! Tasty cooked breakfasts with sensible portions. Friendly & welcoming owners. Would recommend the walking tours starting outside the Guildhall, we went on a "Story of St Ives" tour with Dawn on a Wednesday and it was excellent. Everything was all we could want. Clean, excellent breakfast and friendly atmosphere. One suggestion, a rail in en suite for towels. Very friendly hosts which shares good information about the city and area around the city. Be sure to book restaurants in St. Ives in advance. Everything was excellent, you went the extra mile with everything from breakfast which were exceptionally good - especially the daily specials, very nice touch. Your helpfulness with suggestions of places to visit etc. Can't praise Blue Sky highly enough if was marking out of 10 you would certainly get an 11 from us. Look forward to seeing you both again in the not to distant future. Would recommend the Queens Hotel to eat in, food slightly different to your usual "Pub Grub". Also beware of eating ice creams on the harbour, don't know how many people we saw "dive bombed" from behind by the seagulls, they have it down to a fine art !! St. Ives just a lovely part of the world - get the train to Penzance and walk (3 miles) to St. Michaels Mount and the walk along the costal path from St. Ives to Carbis Bay is lovely. Drive to Sennen and do a short walk on the coastal path to Lands End. If you don't like walking just visit all these lovely places by car. Keith and I arrived on Sunday last week to a wonderful welcome from Lindsey and her and Simon's beautiful house. We were shown to our room - the Godolphin Room - which was really lovely with a balcony where we could sit and see the rooftops of St Ives! We were offered a delicious breakfast with a daily special which were absolutely yummy! Lindsey even baked cake and left this for us upon our return from a day out! Wonderful stay!!! St Ives is a wonderful seaside town with an array of superb restaurants and eateries and local pubs serving very good food. We would recommend the Rum and Crab for a great atmosphere and really great food. Their rum based cocktails and digestives were really good too!! There are wonderful coastal walks for all with beautiful views across the bay. Well worth a visit!!! Spent 4 nights at this lovely B&B friendly hosts, comfortable bed and excellent breakfast highly recommended. We were four ladies who stayed four days with Lindsey and Simon and it was simply wonderful! Welcoming, relaxed, lots of help and advice if we asked about something. Beautiful, restful rooms. Lindsey and Simon are such nice people and have created a calm, restful place for guests to stay. We really felt it as a home away from home. We do think that they (Lindsey?) have an eye for details - like the binoculars by the chair at the window. And the breakfast - that so scrumptious! Having Simon coming up to the table saying´and today´s special is...´ we loved it! Book in time at Blue Sky B&B! There are just a few rooms and with Simon and Lindsey as hosts they are bound to be booked in advance. Staying in S:t Ives means you have a variety of options for outings, walks, restaurants, shopping (S:t Ives is delightful that way!) You walk down to Market Place in 5-7 minutes, and by car you go swiftly out off to the main road. We saw Minnack Theatre, Penzance and Michael Mount, Moushole, Cape Cornwall.... all lovely places. Wonderful views and walks that are easy to access. In S:t Ives we had the best coffee in Coffee Lounge, best crab sandwich at Pel´s, Jambalaya at Rum´n Crab, more seafood at Beach Bar and everywhere we had great food served by really nice staff. We bought hot take-away pasty at Cornish Pasty Shop - pasty it´s a must in Cornwall. And if there are any questions about S:t Ives and Cornwall - talk to Lindsey and Simon. They are the best. Oh, and don´t miss Barbara Hepworth Museum and Sculpture Garden, she´s an iconic modernistic artist! The hotel was lovely and very comfortable. Breakfast was delicious! Extremely helpful and great service. Good knowledge of area. Loved the breakfast daily specials.. good being able 2 use longe area and the cake was lovely..
Simon and Lindsey were very friendly and welcoming, the house was really nice and well placed for town and beach as well as getting in and out of St Ives. And Lindsey's breakfasts were great! We have enjoyed our stay at your B & B very much! You had given us a warm welcome and you are very good hosts! Wonderful breakfast! Lindsay, you are a very good cooker, and Simon, you have been very helpful by giving us very useful tour tips! Thank you very much! Warm welcome with flexible checking in time really helped. Godolphin room was excellent, and small balcony a real asset. Comfort of the room especially the bed made our stay very relaxing. After a good nights sleep followed by a wonderful hot shower in the spacious bathroom, we looked forward to our breakfast which by far exceeded our expectations. Helpful, friendly hosts with a good knowledge of things to do and places to visit. Thank you we shall no doubt be back. 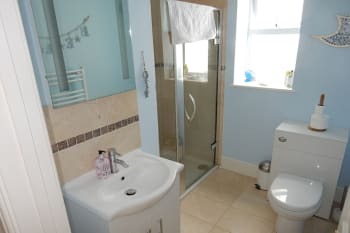 The location is as good as one can hope for in St Ives, with its off-street parking and its being accessible without getting involved in the one way streets and yet being within walking distance of the centre of town. We liked our room, also the welcome and the excellent breakfasts. 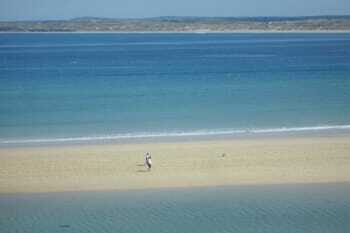 Blue Sky is in a fantastic location within minutes of all the attractions of St Ives. It is also easy to get in and out of St. Ives from blue sky. Simon and Lyndsey were very welcoming and gave us great tips on the local area and the breakfast was amazing. Friendly and welcoming. Wonderful choice of breakfast menu. Thank you so much for a great stay in St Ives! The location was perfect - parking out front and just a short 5 minute stroll downhill into town. Simon and Lindsey were perfect hosts - very welcoming and eager to provide any help or assistance. The breakfast is probably one of the best spreads you'll ever have at a B&B! I booked Blue Sky based on other reviews (all excellent) and they weren't wrong! Simon and Lindsey are a fabulous couple, it felt as though we were staying with friends and yet they weren't intrusive. Our room was spotlessly clean and the beds sooo comfy. Delicious breakfasts too, all cooked to order. Honestly can't find a fault and will definitely return if we are in the area. A friend recommended that we visited Trevaskis Farm for a meal and we pass on that recommendation- wonderful food with very generous portions. About a 20 mins drive from Blue Sky. Had a great time staying at blue sky right near the beaches and long walks cute little shops nice pubs down the road,breakfast very nice room large comfy bed love the shower very clean will deftly stay agen.. Extremely comfortable room with view. Lovely hosts and breakfasts. Simon & Lindsey are so friendly & welcoming, we stayed an extra unplanned day. They are more than happy to share their local knowledge of places to visit & eat etc. Our room, Trencrom, at the front of the B&B had an amazing sea view from the seating area in the bay window. The choice of breakfast were amazing with a "special" available every day. Look forward to returning again soon. St Ives is packed with good places to eat and loads to do. a very warm welcome - a comfy bed-good choice of breakfast and best of all brilliant sunshine as requested! Very friendly and welcoming.Lovely breakfast,great choice. 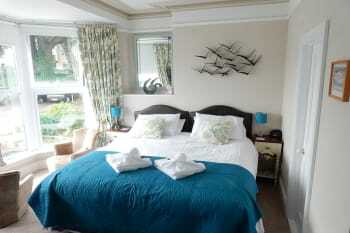 lovely room, really enjoyed our stay and would definitely stay here again if I was in St Ives. Lovely breakfast too. Simon and Lindsey were very friendly, welcoming and helpful. We felt very comfortable with coming and going as we pleased. Blue Sky is a very quiet and relaxing place to stay. We both really enjoyed our stay and would definitely be happy to return. Plenty of good restaurants in town with a good variety of fish and shellfish choices and wines e.g. Seafood Café, Seagrass Restaurant. St Ives also has a number of good cafes and bakeries to choose from. We walked the coast path to Lelant Saltings and Birdie's Bistro on a really lovely sunny winter afternoon and caught the train back, beautiful scenery. Next day we walked toward Zennor to Pen Enys. In the past, we've walked the stunning Penwith section of the coast path from Mousehole to St Ives over 3 days which is magnificent scenery and well worth doing. Very nice and helpful couple. Really enjoyed our stay. We were made to feel very welcome. Excellent breakfast and liked the daily specials. Extremely comfortable bed. Alba restaurant. Walk to Carbis Bay. Great hosts. Very welcoming and helpful. VERY FRIENDLY GREETING AND THE ROOM WAS OUTSTANDING! Thank you so much Lindsey and Simon - you made my son and I so welcome. He talks about you often and can't wait to come back to stay again! Lovely breakfast and cakes too.